There are some basic life and school skills that adults assume teens know how to do — but they really don’t! 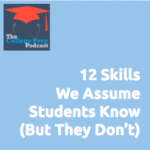 Gretchen and Megan break down 12 seemingly simply skills they’ve observed in their practices and urge their adult listeners to support students in learning how to do these things. visualize what day-to-day life in college is like.